Between the Corvette Stingray and now Camaro Z/28, it is clear Chevrolet engineers take aerodynamics seriously. So seriously in fact, that the new Z/28 sports a modified bowtie just to enhance aerodynamic factors of the car. According to Chevrolet, while testing the Z/28 an engineer by the name of Richard Quinn realized that Chevy's iconic moniker was doing a disservice to air flow; it was displacing air away from the radiator. In a track-ready car like the Z/28, taking cool air away from the engine is never a good thing. Quinn then proceeded to cut out the gold contents of the bowtie resting on the Z/28's grill, leaving only the silver outline. Upon reinstalling the homemade prototype on the grille, he tried out the car again. The results were a win. Affectionally referred to as the "Flowtie" by the engineering team, the hallowed out bowtie added just enough airflow to the engine to cool it by a staggering 2 degrees during track sessions. Those 2 degrees were just enough to mandate the modified bowtie on all Z/28 Camaros. 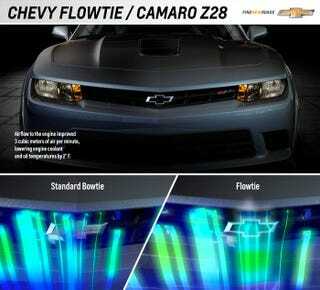 Chevrolet asserts the Flowtie as a strong example of the engineering team's dedication to track performance. Many of the engineers on the team race on the weekends as a hobby, so these kinds of small modifications are routine for these guys. As such, there's clearly no sacred cows for this team; even the legendary Chevy bowtie. The all-new Z/28 weighs about 300 pounds less than the ZL1 and 55 pounds lighter than the 1LE, thanks to a variety of changes throughout the car. The lighter weight Camaro is powered by GM's well-known 7.0-liter LS7 V-8 and will arrive in dealerships this spring.